So I decided to create a set of 10 thank you cards with stamped envelopes instead, with an invite insert that could be glued over the top if that was what she wanted to do… A kind friend (Thanks K) loaned me her Baby Bundle stamp set and I teamed it with the Spice Cake DSP from the Summer Mini. I think the result is a really vintage-y kind of baby feel. 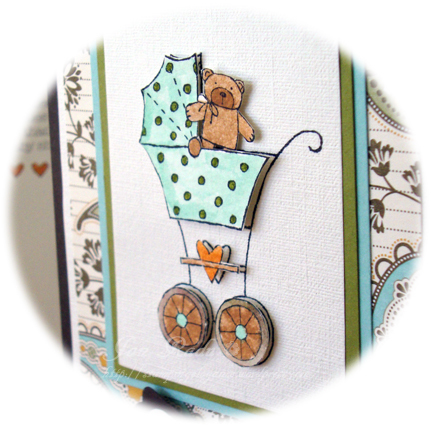 I knew I wanted to water colour the prams after I saw this card from Lianne Carper over at http://www.cardscraps.com – I loved the water colouring and the way she had cut out and propped up the pram, heart and wheels on dimensionals – the wheels, bears and love hearts were coloured directly with markers. I used SU watercolour paper for the best results, and coloured with my aquapainter and ink from the lid of my inkpads. The old olive dots were directly coloured with the writing end of my marker for precision colouring! My basic colour scheme of pool party, old olive, early espresso and very vanilla with a hint of pumpkin pie is inspired directly from the DSP – this is a sure-fire way to guarantee success in your projects – let stampin up do the hard work of colour coordination for you!!! What else can I tell you? Making gifts for people is one of my favourite things to do – this set was truly a labour of love (no pun intended)! Hope you enjoyed looking over my project – I’d love to hear from you if you have any questions about the techniques I’ve used – until next time!